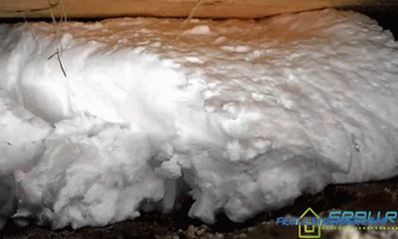 Many people try to save on utility bills. 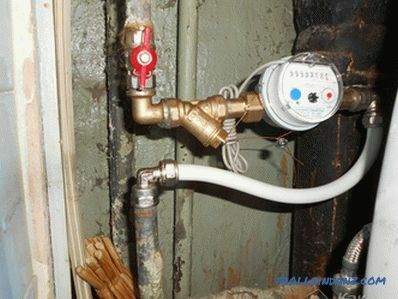 Water meters (hot and cold) functioning in an apartment can be effective assistants in this. You can install such meters on your own. Mass installation of gas, water and electricity meters in the housing stock is caused by regular growth of tariffs for these resources. Counters allow users not only to monitor the consumption of natural resources, but also seriously reduce the payment for its use. Consumption rates, for example, water, do not correspond to the amount of liquid consumed in real life. Without a meter, each resident must pay monthly for 5.5 cubic meters of theoretically consumed water. However, by placing a water meter, you can analyze and notice that the actual water consumption by one person, not limiting himself, is about 3 cubic meters. 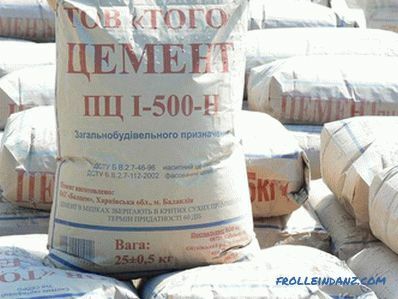 For those who intend to save money and consume this natural resource in the minimum amount, the monthly consumption will not exceed 2 cubic meters. And this indicator is significantly different from the standards. In this situation, the installation of a water meter is very useful, since it will lead to a rational disposal of the family budget. If you plan to perform the work yourself, you should first learn how to properly install the water meter . 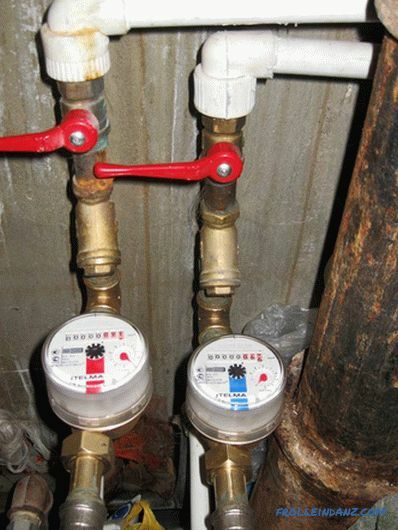 The sequence of installation of the water meter can be divided into two phases: the installation of all its components and, in fact, the installation. For quality work in addition to the counter, you must install a coarse water filter, filtering out all the mechanical impurities from the water, such as sand or rust. The check valve must be installed on the basis of the technical conditions developed by the Vodokanal enterprises. Thus, it is supposed to prevent cases of fraud with meter readings. These components should be mounted in one unit, which will perform the functions of control over the expenditure of water. It is necessary to fasten the nuts (cap) to the filter and non-return valve so that there is no difficulty in dismantling the meter. For successful operation of the counter, it is important to choose the right direction for the installation of components. The manufacturer always puts on the device specific marks in the form of arrows, they set the direction of water flow through the device. Having connected the imagination, you need to imagine the process of water movement through the meter, which will significantly help to rationally mount the device. The cap nuts are attached to the filter from the tip of the arrow, to the back valve, on the contrary, from the end of the arrow. Tow, like other similar windings, cannot be used. 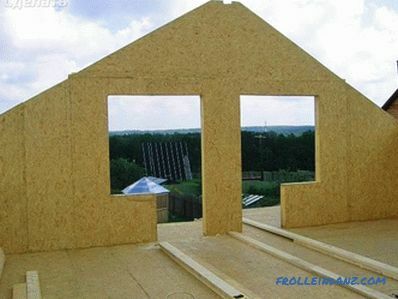 It is necessary to use paronite gaskets, matched strictly to size. Full meter operation depends on the direction of water flow. The manufacturer also put an arrow on it to facilitate the installation process. The arrow should face the shut-off valve located on the riser. In case of strict observance of the direction of the arrows, it is necessary to fasten the counter with the filter and non-return valve by means of cap nuts and paronit gaskets. Violation of the sequence of the arrows will lead to incorrect operation of the counter. This may be manifested in the fact that the meter will spin in the opposite direction, or water will not flow at all through the meter to the taps. No employee of Vodokanal will allow the launch of such a counter into operation and will not install seals on it. 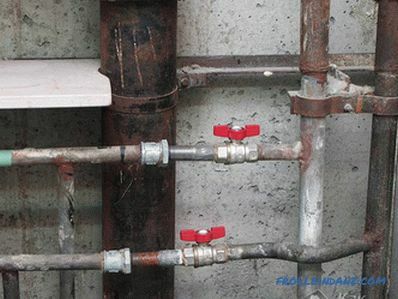 The difficulty of fitting a water meter into the system depends on the technical characteristics of the water pipes. 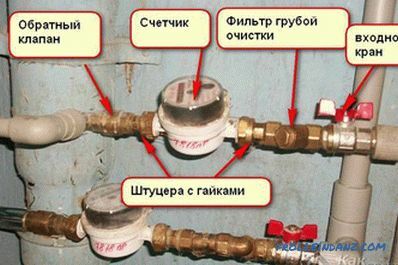 The most difficult will be the process of tapping, if the water pipes are metallic. In this case, useful saw for metal and machine for making threads. As the first connection point, you can use a shut-off valve with already finished threads, the second mating thread must be made separately. In the case of water pipes that are propylene or metal-plastic, the counter will be embedded much easier. 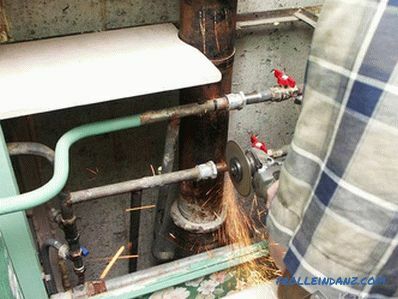 Cut such pipes can be a regular knife. 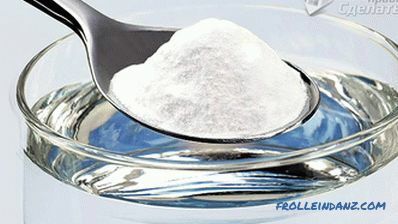 A specific soldering iron and the ability to solder can be useful if the pipes are made of polypropylene. To insert the water meter, the pipe must be cut, with the tow attached fully assembled water meter unit to the shut-off valve located on the riser. 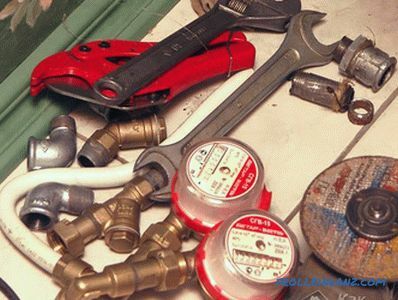 Then you should firmly attach the counter to the faucet, determine the point for making a return thread, cut off the excess pipe.At the selected point, a thread is made or soldered (fixed) a metal-plastic system fitting. Installation of counters to the newly made thread. Next, fasten the flare nut with the meter, open the shut-off valve and carefully view all connections made for leakage. 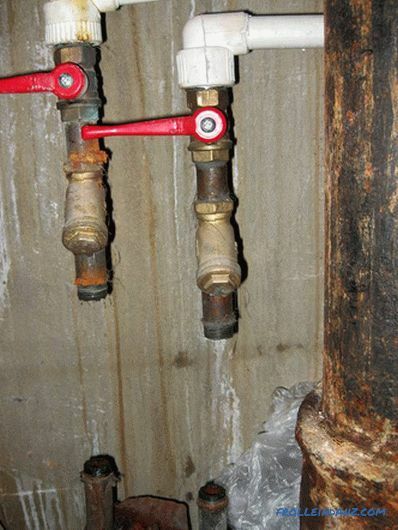 If necessary, eliminate existing leaks, after which the water meter can be put into operation. It is advisable to once again carefully follow the direction of the arrows on the device, they should all be looking in the opposite direction from the cut-off valve. Then you need to invite a specialist to seal the water meter.